Not creepy, just a bird in front of a surveillance camera, probably utilizing some updraft as he seems to be resting for a split second in flight. It's a stroboscopic effect. His wings are flapping in sync with the camera's shutter. 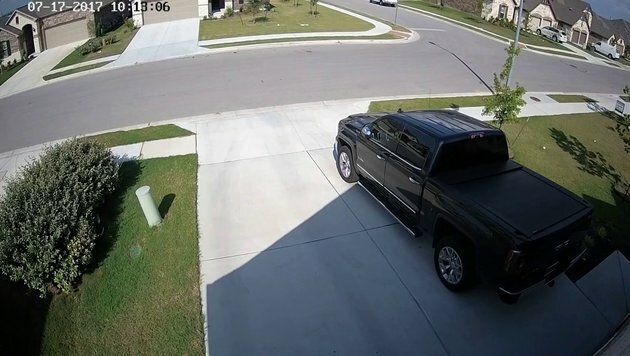 There is usually a slight delay on home surveillance camera's giving a slow motion effect, which is why the bird here which is a sparrow appears to be a hummingbird. And only yesterday someone rolled there Range Rover on his drive. It was hanging by a giant cobweb, - like a kind of avian Tarzan, if you please.